An intensely readable book, frank and ingenuous; the author, Lindsey Davis, commences with her family background and background to writing. Writing is always an intensely personal affair; the life story and sitz-im-leben of the author always has something to contribute. The Novels are all introduced, along with character entrances and exits, and the necessary research for the same. Schooling, friends, travels, events, incidents and the level of the author’s bank balance all contribute. A very useful summary of the novels which just about makes this website obsolete! There is a part in this book wherein the morality of Falco, his drives to action (and those of Helena Justina) surge forth. Ditto for Petro, and their antithesis and arch-enemy, Anacrites. Falco is shown to be a decent man, who knows himself and his limits, along with his skills and abilities, to full. Such a man would have been a priceless gem in the Rome of the Flavians, but how long he would remain alive might be another matter. All places where politics is the talk of the day are places of jealousies, and power is always dangerous! 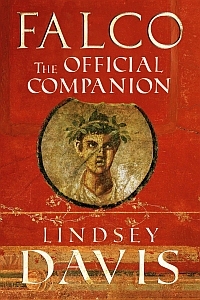 A very welcome part of this book is Lindsey Davis’s backstory on all the characters who were created, along with the family tree of Didius and Verus (Falco and Helena Justina). There is an enlightening backgrounder on Geminus – Falco’s Father – and Ma Favonia. The Verus family are shown in full, along with Jason, the great snake and his handler, Thalia. Ditto the ladies who play the water organs. Sextus Julius Frontinus is always a finely delineated character. I have been confused by Rome as it is said to be a city built on seven hills. I have struggled to picture these hills, the Aventine and the Palatine, and what the forum actually looked like. “Place” is an excellent section in this book, and gives accounts of the many places Falco inhabited. Alack, we may never find Fountain Court and Eagle Laundry! Time, the hours of day, the work of Informers, Law and Order (Vigiles! ), and other aspects of Roman life all fill the remainder pages of this book. Ditto the necessity of torture in ancient Rome, and the rights – or lack thereof, of slaves. There is a frequently asked questions section from the Author’s mailbag (or mailbox as the case may be). Falco and related generic writings are the moral copyright of Lindsey Davis; these reviews, observations and matters on Human Values and Leadership are the copyright of Chris Parnell.